Esther Schipper is pleased to present “Songbook” by Ari Benjamin Meyers. “Songbook” is the title of this show. 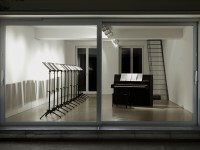 “Songbook (ES13)” is also a collection of compositions created during the four weeks of the exhibition. These compositions are in a very real sense the show itself, being portraits of the opening and closing, of some visitors to the show, and of all those working at the gallery. “Songbook” can of course be performed. The show also exists as a performance. A visitor to the show is witness to a process that started before the opening and will continue after the closing. The exhibition by Ari Benjamin Meyers is an inquiry into how to present and represent music within the gallery context. Avoiding straightforward visualization or auralization of a composition, he focuses instead on the act of creation and performance itself. The artist attempts to address an expanded field of music where ideas, concepts, references and a subjective approach are at least as important, if not more important than what we commonly understand as music: namely the way a composition sounds and that sound’s technical perfection. The work on “Songbook (ES13)” began with the artist asking each member of the gallery staff one simple question: do you play an instrument? This question evoked other questions: If you play an instrument, which one, and why? If you don’t play an instrument, why not? If you could play any instrument at all, which one would it be? These questions and answers became sources of the short, mostly solo instrumental and vocal composition-portraits that make up “Songbook (ES13)”. In the course of the interviews a musical biography of each person began to take shape and the collective sound of the gallery started to emerge. 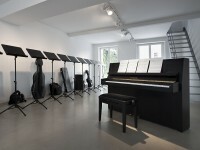 The resulting score which will be completed during the show can be seen as a musical psychogram of the gallery, of the people working there, and of the gallery guests. The instruments on display, albeit at first in their cases, constitute a mute orchestra and testify to the musical potential of the gallery. They are physical and silently aural representations of the discovered musical skills and fantasies present there. These instruments will be activated during rehearsals and workshops that will lead up to performances by the gallery staff, which may or may not be witnessed by an audience. By the end of the show all of the instruments will have been removed from the gallery. 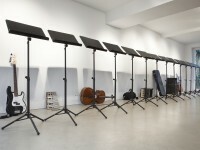 Only the remaining music stands and compositions will be left to mark the positions of the quasi-private performances that have taken place. On days when Ari Benjamin Meyers is working in the space, visitors themselves have a possibility to enter the piece through a composition entitled “Visitors”. The current show begins a series of individual one-off portraits to be composed by Ari Benjamin Meyers.